Who says the king isn’t alive? Elvis Lives and proves this certainty with Scientific Games number one hit, the Elvis Lives slot. Showcased across American casino floors and online, Elvis Lives slot is one of the most popular slots in the industry, and for good reason too! The King of Rock ‘n Roll will take you on a nostalgic journey with every spin of the reels through concert footage and his iconic hit songs. The Elvis Lives slot accommodates every type of slots player, whether you’re looking to low roll a few spins, or bet higher in search of claiming the top progressive. Elvis Lives slot offers several betting limits; .90, 1.80, 2.70, 3.60 and 4.50. Each betting level adjusts the paytable accordingly, with max bet being 4.50 a spin. When the max is enabled the top progressive jackpot is in play, but betting a lesser amount can, and will land you one of the smaller progressive jackpots. The Elvis Lives slot was designed to fit the Gamefield xD cabinet. This cabinet delivers the ultimate gaming experience with immersive interaction and instant access to engaging features. You will get “All Shook Up” when you trigger two of the Kings’ free spins features. Elvis Lives offers an Aloha Free Spin Bonus and a TCB Free Spin feature. Different amounts of free games are awarded with each feature and the chance to win up to a 30x multiplier for all wins. TCB Free Spins offers plenty of opportunity to land additional free spins when the Extra Spins symbol appears on reel 5. 4 extra free spins are awarded with three extra wilds appearing for the duration of the free spins. The TCB free spins feature offers the chance to win up to a 5x multiplier. The Aloha Free Spins bonus awards 7 free games. There are two different wilds during the free games feature; the double and wild symbol. When one of double wild appears, all wins are doubled. These special wilds may appear in stacked motion across the reels when they appear. The main wild of the game is also included in the spins. Who remembers Elvis’ famous jumpsuits? This was one of his signature features, and of course they were implemented into the slot machine. The Jumpsuit Jackpot Pick Bonus is clearly the main attraction of the game. When this feature is activated you must choose different gems to determine your bonus win. You get 5 picks to start off with. When you collect a certain number of gems you progress to the next level where the gems are valued more than the previous round. The main objective here is to advance through all the levels to earn the highest of all gems. There is a possibility to win up to 750x your bet. The game offers a wild symbol which is Elvis posing during his Memphis appearance. This wild substitute for all symbols in the game except for a few other Elvis posing symbols, including the Elvis in Concert logo. All wins pay from left to right beginning with the left most reel. Other symbol included in the game are a microphone, sunglasses, flowers, awards and the standard poker playing card values. 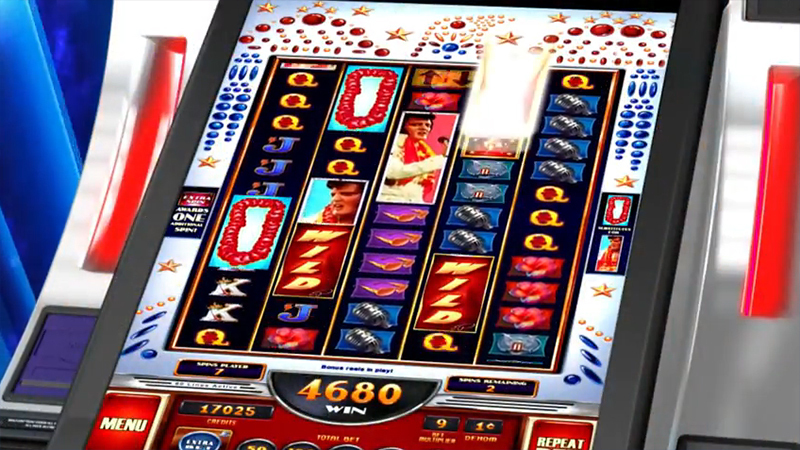 The Elvis Lives slot also offers the Elvis Lives feature. This feature is triggered when the Elvis Lives symbol appears. Once this feature is activated an alternate reel set will appear where your main goal is to line up the letters; E.L.V.I.S. You will start the bonus off with instantly earning the E. When the reels spin, if a letter you already earned is spun you will see the “already collected” symbol. You will continue to spin until you collect all letters. A bonus cash prize will be awarded with the amount determining on how fast you collected the letters. Win up to 800x your bet during this feature. Spinning five Elvis in Concert logos on line one betting max bet rewards the top progressive jackpot of the game. Each progressive jackpot is guaranteed to payout a certain threshold. Once the jackpots are won they are reset to its ‘minimum’. There’s tons of Elvis themed slots out there, but don’t let that confuse you with the Elvis Lives slot. Nothing compares to the iconic King of music. Elvis Lives slot is the perfect game to remember the king and all of his popular songs’ Blue Suede Shoes, Hound Dog, Suspicious Minds and Can’t Help Falling In Love. 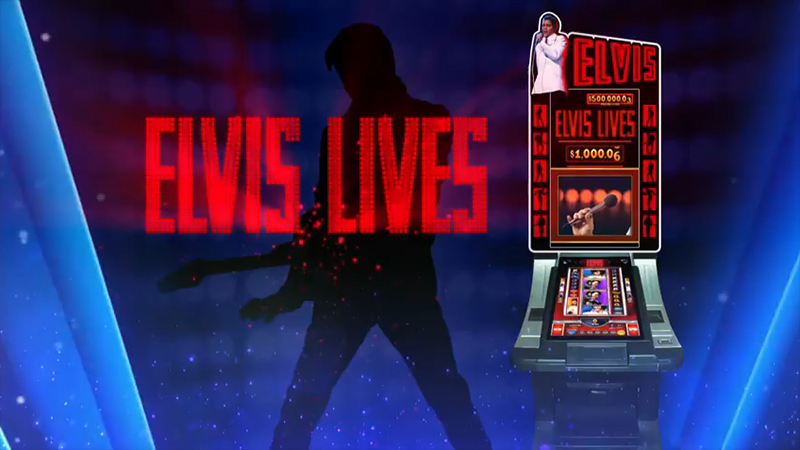 Look for the Elvis Lives slot in a USA land-based casino near you!